The pull up test (also called the chin-up test) is widely used as a measure of upper body strength. The following information describes the procedures of this test as used in the President's Challenge Fitness Awards and FitnessGram. purpose: This test measures upper body muscle strength and endurance. procedure: Grasp the overhead bar using either an overhand grip (palms facing away from body) or underhand grip (palms facing toward body), with the arms fully extended. The subject then raises the body until the chin clears the top of the bar, then lowers again to a position with the arms fully extended. The pull-ups should be done in a smooth motion. Jerky motion, swinging the body, and kicking or bending the legs is not permitted. As many full pull-ups as possible are performed. scoring: The total number of correctly completed pull-ups is recorded. The type of grip should also be recorded with the results. variations / alternatives: There is a similar PFT Pull Up test description. See also the NAPFA pull up which includes an incline version for younger students. Alternative tests to the pull up are the flexed arm hang or push-up test. target population: sports in which upper body strength is important, such as rowing. advantages: the equipment is readily available, and this test is easy and quick to perform. disadvantages: due to variations in technique and whether the arms are extended or the chin reaches the bar, the scoring can be subjective, therefore it is difficult to standardize the results. For those with poor upper body strength, no pull up may be achieved. For such groups, an alternative test of upper body strength may be appropriate. Alternative tests to the pull up is the flexed arm hang or push-up test. The body weight of the subject has a great effect on the results of this test. For some subjects, they may need to be lifted up to the starting position. Check for improper technique such as legs swinging or kicking, and failure to fully extend the arms or get the chin over the bar. 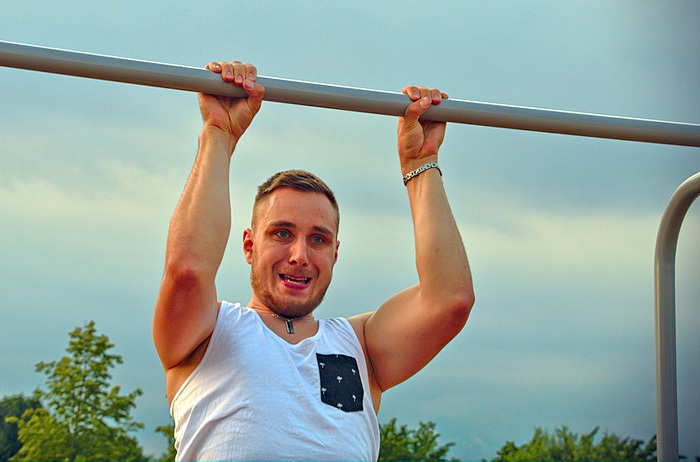 The subjects should be instructed to spend as little time hanging from the bar beforehand as possible as the extra time on the bar may cause fatigue and reduce the number of pull-ups performed. When repeating the test, ensure that the same grip technique is used each time. The terms chin up and pull up are often used interchangeably, though some people consider that when using the overhand grip (palms facing away from body, pronated grip) it is a pull up, and when using an underhand grip (palms facing toward body, supinated grip) it is a chin up. another pull up procedure from the PFT, and the NAPFA pull up.